Short Review: In a praiseworthy attempt to try something different, Dale and Gregoriades have set out to produce an instructional DVD based purely on concepts. They are both articulate teachers and adept in front of a camera. Their choice of examples to illustrate the concepts are also sensible and the editing is skilfully done. Most of the concepts are also solid, like the importance of post, posture and leverage for sweeps. However, while I respect and support innovation, I remain unconvinced that pure concepts is an effective way to teach BJJ (I should note, each concept on this DVD does have two brief examples). To make an analogy, it feels like trying to learn a language by throwing away your vocabulary books in favour of some pointers on grammar. Having said that, perhaps I just don't have enough words in my personal BJJ dictionary to appreciate those overlying connections. Available here for either $49.99 for a digital download or $59.99 for the DVD. Long Review: Since I first met him at the Roger Gracie Academy back in 2006, Nic Gregoriades has successfully built a brand identity. Through a combination of podcasts, videos and savvy social media engagement, along with extensive seminar tours, Gregoriades is now a relatively well-known figure in the small BJJ community. In the last year, he has leveraged that growing profile to launch instructional products, beginning with The Black Belt Blueprint, a book I reviewed a few months ago. Kit Dale has also transformed himself into a brand through clever use of social media, but in a markedly different approach to Gregoriades. Whereas the South African black belt is known for his philosophical and even 'spiritual' angle, Dale has been making a name for himself as a comedian (in the limited sense of the BJJ world, at least). Together with his brother, Dale has unleashed a steady stream of videos from his base in Australia, well-received by his target audience. BJJ comedy is a small field at present and most of Dale's competition isn't to my taste, such as Rhasaan Orange's 'take the mick out of Brazilians' schtick. 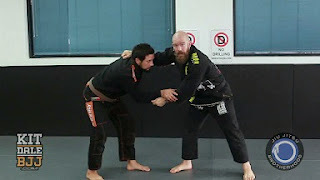 Admittedly I have followed very little of the videos that make up this nascent BJJ humour scene and none at all of Kit Dale's, until I came to write this review. Like Orange's material, Dale's comedy stylings aren't to my personal taste either, but they've proved to be a big hit with plenty of others. Due to his adept understanding of the online world (I can think of only one mis-step, when he threw his support behind the TLI-tainted spammy marketing of David Avellan), Dale has considerably enhanced his name, meaning that like Gregoriades, his visibility does not depend on his competition success. To be fair to both of them, especially Dale, their competition success is not negligible, but it would not be enough to make their name. The same is true of several other major BJJ instructional producers, perhaps most notably Roy Dean. Dale has made regular statements (like this) criticising the orthodox method of teaching and learning in jiu jitsu. Essentially, Dale has led a 'no drilling' campaign. At face value, I and many others would view 'no drilling' in particular as a deeply flawed methodology. However, from what I've read (and this may be a misinterpretation on my part), it isn't really 'no drilling'. More accurately it appears to be 'no dead drilling', a far more sensible position. This is an idea Matt Thornton from Straight Blast Gym popularised under the name 'aliveness' well over a decade ago. I've been a fan of the SBG methodology for a long time and more recently, it has guided my approach to teaching since my first class as an instructor in 2011. Either way, that 'no drilling' marketing has fed into a new DVD collaboration between Dale and Gregoriades, dovetailing with Gregoriades' efforts to teach concepts. Hence the title of this new release, Beyond Technique. As with The Black Belt Blueprint, that's a laudable idea, but difficult to put into practice. I'm not convinced it is possible to teach purely through concepts with any kind of efficacy: concepts are valuable and were put to good use in Demian Maia's popular set, but that was still a 'traditional' instructional with a catalogue of techniques. Ryan Hall is another example of someone that uses a lot of theory, but not pure theory. Adam Adshead's old DVD is perhaps the closest to Beyond Technique, though again that was still more a collection of techniques, if heavy on the conceptual side. Beyond Technique seeks to prove the pure conceptual model can work. The idea of an overarching concept that can unlock a large set of techniques is appealing. Like the old saying goes, it's much better to teach someone how to fish than to simply give them a fish. If an instructional can provide the student with broadly applicable concepts that apply to many situations, compared to techniques that might only apply to a handful of scenarios at best, that's clearly valuable. Can it be done, and if so, have Dale and Gregoriades cracked it? 'Teach them to fish' is echoed by the exhortation in the introduction by Gregoriades and Dale, who state, "Your job is to look at our examples and then find examples of your own." Gregoriades then claims that this DVD will 'turbo charge' your jiu jitsu, thanks to that focus on concepts. They are presented as a short-cut to instant improvement: that's a tried-and-tested way of marketing your product to students hungry to progress in anything that takes time and considerable effort to master. The instruction begins with transitional pressure (two minutes), essentially describing the importance of maintaining pressure as you switch between positions. It immediately highlights a problem I've observed with just about every BJJ DVD I've ever watched: 'talking heads'. In other words, an instructor sits on the floor and lectures to the camera (in this section, that explanation takes up roughly half of the two minutes total of instruction). I can understand why talking heads get used so often, as it's a natural way to teach, but I have always felt it is a waste of the visual medium. The same is true of documentaries on TV, where the camera has an irritating habit of following the presenter around as opposed to focusing on the subject matter. If I have sat down to learn about Artemisia Gentileschi, then I want to see her paintings, not Andrew Graham-Dixon's flowing locks. Rather than staring at somebody's head, it would be far more useful to have that Gregoriades lecture in voiceover, while some relevant footage plays underneath it. To be fair, this isn't just an issue with Beyond Technique, it happens on virtually every instructional DVD I've watched (e.g., I made a similar criticism of Purple Belt Requirements five years ago). 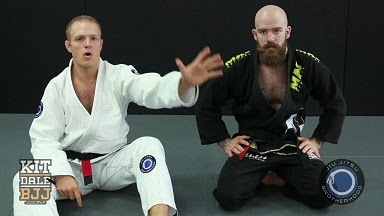 However, it is perhaps more obvious on Beyond Technique, because the conceptual approach leads to a lot more sitting and explaining, compared to a typical BJJ DVD. Gregoriades' teaching style also lends itself to extended soliloquies. After that lecture, the teaching progresses into a couple of examples, showing how the concept can be applied. Next up is the Fisherman, switching from Gregoriades to Dale: this alternation continues for the rest of the DVD (I should note that for review, I was sent a download link to a video, but the commercial version is additionally sold as a DVD). Dale spends about a minute describing the ideal way to reel your arms back in when your posture has been broken. Gregoriades returns with the Quadrant (longer this time, at around four minutes), a new name for the old concept of the four chair legs. I've most often seen this with the upa/trap and roll, where the students are told they need to control two of the chair legs (i.e., an arm and a leg on the same side), as that makes it very easy to knock the chair over. Gregoriades expands that idea to multiple positions. He talks about each leg of the table defending a quadrant, so when that table leg is missing, you can then sweep them into that quadrant. After a minute of explanation, Gregoriades illustrates his point with an x guard sweep, noting that when his opponent commits a hand, that opens up a route to sweep them. Similarly if they're in combat base, because they're sitting on a leg, you can push them in the direction of the foot they're sitting on. There's some more talking at the end, where Gregoriades tells you how he came up with the idea. Dale then takes over with Post, Posture and Leverage (two minutes). Both he and his partner are wearing the same colour gi, making it a bit harder to distinguish limb from limb, but apart from that error, this concept is one of the highlights of the DVD. This follows on from the quadrant, using that concept to feed into sweeps. Like most of the best concepts, it's simple. Wherever you are, Dale argues that if you can get control of their ability to post and control their posture, adding in some leverage will result in a sweep (if you can only get two, that can still function if you have them especially secure). The standard example is from butterfly guard: it can also work when you're in a less advantageous position. Dale uses his principle to sweep despite his opponent securing double underhooks. He takes away their post by grabbing a wrist, then he uses his legs to break their posture. Finally, the leverage comes from reaching under the leg with his arm and lifting. When it comes to 'broadly applicable' this is tough to beat, as you'll have a wealth of opportunities to practice in a typical sparring round. I can't say thinking 'post, posture, leverage' has notably upped my success rate with sweeps, but it has been a handy goal to keep in mind over the last month or so. I was much less keen on Gregoriades' next concept, the Porcupine, but that's due to my own personal hang-ups rather than anything ineffective about the idea. In short, Gregoriades advises making yourself 'spiky', so that it becomes painful for your opponent to try and control you. It's a nastier extension of framing your arm into their neck under side control, where if they press forward, they drive your forearm into their own throat. On a production note, there is good use of the zoom here, highlighting important details. You can create those 'porcupine spines' from various positions, like jamming your forearm into their neck when you're setting up butterfly guard. Even less pleasant, you can dig your elbow into their sternum as they try to apply scarf hold. It certainly works, but I don't want a game that relies in any significant way on pain. Of course, you could argue that the whole point of jiu jitsu is causing pain, in order to make them quit. I'd counter that there is a distinction between 'checkmating' somebody based on leverage and control rather than something like digging your chin into their eye socket (a la Mark Kerr back in the day), but I can see the argument. Dale and Gregoriades introduce the next concept, nullifying the guard pull (a minute and a half). This is quite specific and like the previous technique, not especially connected to what has gone before. The organisation of Beyond Technique is somewhat scattershot, rather than the cohesive set of techniques you would find in something like Saulo's first set broken down by position, or the meticulously organised Ed Beneville books. On the other hand, it is more difficult to organise concepts than positions, especially if those concepts are broadly applicable and therefore don't fit comfortably into any one box. Gregoriades then spends four minutes discussing the Corkscrew. Instead of pushing straight out with an arm, he likes to rotate, corkscrewing the arm. For example, corkscrewing when performing a stiff arm escape, or in the opposite direction, rotating your arm as you pull it in towards you. Dale's weight distribution (two minutes) is not on the topic of controlling them in mount or side control, like you might expect, but more about your balance when they have de la Riva. The central idea is adjusting your weight to make it harder for them to sweep you. Next up is four minutes on another concept I find applicable to my own training (though I'd just refer to it as framing), collapsing and inserting structures. Gregoriades uses the example of shoving his elbows inside his knees, to stop people collapsing them together when in butterfly. The opposite applies too, such as when he is stiff with his arm, then suddenly collapses it in order to move around and pass. There's almost an element of aikido here, using your opponent's pressure against them . Dale is generally better at coming up with memorable names, though they aren't as descriptive. His double-barrel shotgun (a bit under two minutes) relates to maintaining guard. If you imagine your legs are bullets, don't fire them both at once. If you shoot one bullet, make sure you have another in the chamber. That makes good sense for guard retention, as long as a beginner doesn't misinterpret it as only ever using one leg. A key principle for open guard, I would argue, is making sure you have all of your limbs engaged. You don't want to be in a situation where a foot that could be pushing into their hip, pulling behind their knee or pressing against a biceps is instead just lying on the floor. The open and closed chain (three minutes) is illustrated by two submission defences. First, hiding your arm in the crook of your other elbow to scupper an armbar. Here the arm is the 'chain' you want to hide: if it is open (as in, not attached), then it's vulnerable. The second example is driving your foot to the floor if they are trying a lower body attack, 'closing' the chain. I'm not sure I fully understood what Gregoriades was trying to explain here, as it seemed to boil down to "hide your limb if they're attacking it." I'm sure that's an over-simplification on my part, but either way, the idea of not exposing your limbs to attack is eminently practical. Slightly under two minutes follow on removing leverage, exemplified by jamming their hooks in butterfly with your arm. That forces their legs together and negates the sweep. Gregoriades then gets into a principle I recognised from the Dave Jacobs seminar, though Gregoriades has a different name for it, spinal torque (four minutes). This is comparable to what Jacobs calls the 'supine twist'. In short, get their head to face away from their hips, an awkward position that considerably reduces their mobility. The examples are clear and helpful, looking at spinal torque in side control and when passing the quarter guard. I felt it was a bit of a stretch to call size specific strategy a concept, as to me that's in a different category altogether, tactics. Still, the advice is reasonable, Dale suggesting that against taller people, 'attaching guards' like sitting, de la Riva and x guard are going to be more effective that long range open guards. The reverse is true if you're taller, to make the most of your size advantage. Dale takes the example of passing, saying that a taller person might go for something like the bullfighter, whereas a shorter grappler is better suited to getting in close. Gregoriades offers up border patrol as his next concept, spending three mnutes discussing how you can treat your torso as a border. To prevent your opponent securing control, block their entry through your borders. Should they manage to slip through, make sure you get something in the way, be that an elbow or a knee (he points back to the 'double barrel shotgun' idea here). If you're the one on top, then you're looking to get past those borders. It reminded me a little of John Palmer's 'control point framework', which I've frequently used since he explained it to me a couple of years ago. Loading the spring (a bit over two minutes) felt very specific, but that's probably because I mainly associate that kind of tension manipulation with one technique, a bullfighter pass variation where you redirect their leg power out of the way at the moment they push back into you. Dale also takes the example of a scissor sweep as they try to pass your de la Riva, a guard I almost never use so it wasn't as immediately recognisable for me. Although not ground-breaking, the Pendulum is a powerful concept that applies to lots of different techniques. Gregoriades takes the classic example of using a leg swing to sit-up from guard. He then shows how you can also use your head in a similar way, swinging it through when you're switching from a tripod sweep into a sickle sweep (he calls it the tomahawk) if they step back. Dale spends a couple of minutes of takedown postures, where again, I'm not sure I understood it fully. The examples included "if they're upright, go for their legs", which again felt more like a tactic to me than a concept, but that's getting into semantics. Gregoriades then comes in with another basic but important concept, hip-centric movement (slightly over two minutes). You might think that would be all about moving your hips side to side in the guard and escapes, but he actually means thrusting them forwards when coming up after sweeps. The last concept on the set is dubbed the Misdirection, related to grips. This is another old school tip you'll see in numerous other sports, combat sports in particular. If they're looking at your eyes, stare away from what you're actually going to grab/punch/kick. I learned something similar back when I did a stand-up style, in relation to faking them out when punching. After watching the DVD, I would conclude that concepts are extremely useful, but only if you have the techniques to flesh out a workable frame of reference. Showing a couple of possibilities to illustrate a concept is helpful, but in my view it's not enough to drive the concept home, especially for beginners. I think that Beyond Technique points the way to what could be achieved with a conceptually-drive DVD, but it isn't quite there yet. In my opinion, a better use of concepts would be as a framing device, stringing together a series of techniques. For example, Gregoriades could have a section on passing introduced with some of the concepts he puts forward here (e.g., removing leverage, transitional pressure, hip-centric movement). He could then progress to detail a series of passes, referring back to those concepts each time, with a summary at the end bringing it all together. There's an element of that in Beyond Technique, but each concept is covered too briefly to really delve into those examples. The somewhat haphazard organisation also takes away from building connections between the concepts, or at least that was my experience. Now, I understand why this DVD is not laid out like that, as the express purpose is to move away from the orthodox style of teaching, where techniques are broken down step by step. I should also note that there are some techniques to give context, if only brief. Yet after watching the DVD, I'm still of the same opinion I discussed at the start: pure concept lacks a frame of reference. Without a solid and carefully detailed set of techniques to give the concepts substance, they float away. Of course, I'm speaking as a purple belt and from the perspective of my particular learning style. Others may well disagree with me. Indeed, Matt Jardine has an article in an upcoming issue of Jiu Jitsu Style that talks about concept-led teaching and specifically name-checks Beyond Technique as an exemplar. Seymour also got a lot out of the DVD, so for a different (and brown belt level) opinion, take a look at his review here. For an instructional that is less than an hour long, the asking price of $49.99 for a digital download (or $59.99 - around £38 - for the DVD) is in my opinion rather high. To draw a comparison, Roy Dean's Blue Belt Requirements is $44.95, which gets you two DVDs (eighty-eight and sixty-nine minutes respectively) crammed with technique. Then again, you could argue that concepts which apply to a broad set of moves are inherently more valuable than individual techniques. I'll be curious to see if I come back to this in future and realise it has grown in usefulness or not. You can buy Beyond Technique from this squeeze page, which promises 'secrets', which will allegedly "make your jiu jitsu much better, much more quickly than anything else out there." Gregoriades used similar marketing for his last release and Dale has been getting into the '90s style too. I'm not a fan of that kind of marketing, but to each their own. Now, I am a fan of innovation and trying something different: I therefore applaud what Dale and Gregoriades are trying to do with their conceptual approach and I'll be looking with interest to see how they develop that product line further. Excellent review. I always love your detailed analysis. Deep, careful and insightful as always. High quality and why I keep coming back to your site. Keep it up! And thanks for the review as this product caught my eye this week and I was curious about it. So perfect timing! Thanks for the kind words. If you're interested in conceptual instructionals, I'd say Ryan Hall would be worth a look too. In my opinion, his Defensive Guard is by far the most successful DVD in the conceptual vein so far (Open Elbow by Hall is good too).